A worm is a long creature with no legs or backbone. More loosely, insect larvae and even some adult insects are sometimes called worms. Figuratively, a worthless, despicable person can be called a worm. In its plural form, worms is a medical disorder caused by worms living in the intestines of humans or animals. 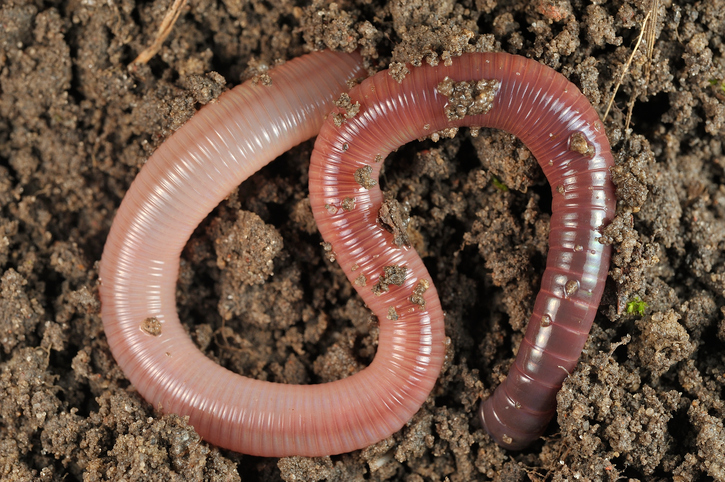 As a verb, to worm means ‘to creep, crawl or move slowly into or through a small or tight place’ or ‘to cause to move stealthily.’ Worm also means ‘to free from worms,’ if we are talking about either humans or animals. There were worms wiggling in the soil. Worms have been eating the apples on the tree in the garden again. I never want to see or speak to that worm again! Cats and dogs often get worms. George had forgotten his keys and had to worm through a small window. The pickpocket wormed his hand into the man's coat pocket. With a sigh, Sabina prepared to worm the cat. Another meaning of worm is ‘snake or dragon.’ This meaning is archaic, but you might come across it in older literature. Worm dates back to before the year 900. The Old English noun wyrm (the ‘y’ was pronounced like the German ‘ü’: an ‘e’ with the lips held like a ‘u’), originally meant ‘serpent, snake, dragon or reptile.’ The sense ‘earthworm’ appeared in late Old English. The word was spelled as wyrm or wurm in Middle English; the spelling worm started to appear in Middle English, most likely because scribes started changing ‘u’ to ‘o’ in words where it appeared before m, n or r, in order to avoid the misreading of words in the old handwriting style. Worm can be traced back to the Proto-Germanic wurmiz and the Proto-Indo-European wrmi– (worm), from the PIE root wer– (to turn or bend). It is related to the Old Saxon and Old High German wurm, the Old Frisian and Dutch worm, the Old Norse ormr, and the Gothic waurms (all meaning ‘serpent or worm,’ as well as the German Wurm (worm), the Greek rhomos and the Latin vermis (worm), the Old Russian vermie (insects), the Lithuanian varmas (insect or gnat) and the English noun vermin, among others. Originally, worm could be used to describe anything long that crawled or wriggled, including serpents, maggots and even scorpions, as well as what people thought were the causes of some diseases. Modern science created more distinct categories for each of these creatures, and from the 17th century, worm was no longer used for any other type of animal. The use of worm as an insult, meaning ‘miserable person,’ dates back to Old English, and the plural form, worms, has been used to mean ‘a disease caused by parasitic worms’ since late Old English. The expression can of worms, figuratively meaning ‘a complex situation,’ dates back to the 1950s in the US, and is probably a reference to the tangled, wriggling knot of worms seen in the cans of live worms sold at fishing shops. The verb, meaning ‘to move like a worm,’ comes from the noun and dates back to around the year 1600. The figurative sense appeared around the same time, while the meaning ‘to free from worms’ dates back to the early 17th century.